I think it’s fair to say, at this point, the builder and I have no secrets about not enjoying working together. I’m not really that bothered by this. I’m not here to make friends, i’m here to get this build done and finished at some point in my lifetime. As you all know, the one piece of the puzzle we’ve been waiting for it the ‘S’ word. I wrote a post months ago full of inspiration for our soon to be staircase. We loved the idea of a simple white stringer with blonde timber tread. Specifically birch plywood. If you like a bit of #Stairporn like me, I’d highly recommend a read of the post here. There are some beautiful flights of fancy to ogle. Geddit? What should have taken 2-3 weeks to manufacture has taken nearly 10. I absolutely know and happily admit i’m not a patient person. I want things done and don’t have much time for people that don’t do what they say they will, but I think even the most patient of individual would feel a little narked at having to wait over three times longer for something to materialise. Or is that just me? After waiting in all day for it Wednesday. The staircase arrived on Saturday. Just as I was going to work (sods law). I was a little faint with giddiness at this point. Is this real? **rubs eyes** Am I seeing things? It took five guys to get our staircase down from the truck, into the house and up the stairs. It felt a little wrong to take photos of that bit as they were really struggling. Me coo-ing and taking photos would have kind of taken the mick a bit. So I looked onwards, hands shaking, heart racing and every cell of my body hoping it would fit. With a bit of jiggery pokery, heaving and huffing, the guys rested her on the trimmer of our new second floor. She was in. She fit. And my heart was racing. I was given first go as it were. I’ve never loved climbing a staircase so much. I used to be super scared of open risers, but the thickness of the birch ply treads made up for that. It all felt very substantial indeed. To get past building regs we will need to add some bars across the back as any opening on a tread can be no wider than 100mm. But once it’s been signed off, we can do what we like. A-hem. Once our box room is empty and the window unveiled again, the light will come straight through the treads, casting shadows on the wall beside it. We’ll also be adding a banister and handrail which we’ll be getting done by a metal fabricator. A bit of powder coated white sounds nice to me with invisible/minimal fixings. Still lots to do before we can get that measured up for manufacture, we’ll probably be handrail-less until February. So we shall be proceeding with caution. This was the view from our bedroom as we woke on Sunday. Felt like I was in a magazine, I did. It’s not a fancy staircase by any means. There’s not a lot to it. It’s functional, it fits wonderfully in the space and gets us up and down the stairs. Was it worth the 10 week wait….? Love the birch ply!!! 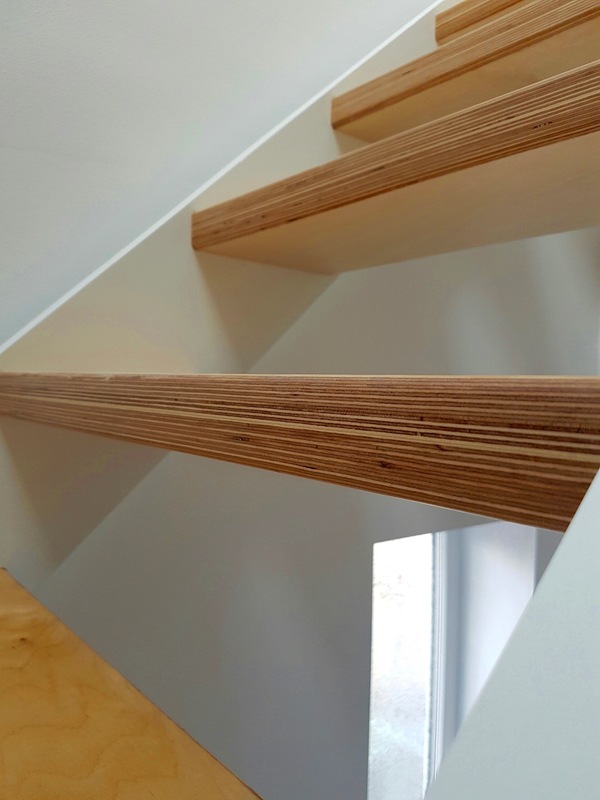 really lovely simple stairs. great job! Yes they look fab, very scandi. I emphasise with your feelings of frustration, I’ve absolutely no patience whatsoever with trades that tell you one thing then deliver on something completely different. Just tell me the truth, I might not like it, but my expectations aren’t ruined. There…I’m raging with you😂. Looking forward to the reveal. EXACTLY! I deal in facts and truths with all of my clients, so why can’t they? I’ve never known ANY industry apart from the building industry get paid and make so much money for being less than average and with no level of customer service. Unbelievable!! JESUS! It’s real! And beautiful! So nice. I’d totally freak out with the gaps as I’m scarred of heights but it works for your pad. So clean and minimal. Perfect for your home. Thank goodness it finally arrived! It’s lovely, very nice wood and seems to fit like a dream. Can’t wait to use it, could have been a brillo slide. Thanks for stopping by. Yeah we’ve considered glass, but if I’m honest, I’m not a fan of it. I think if you can get away with invisisble fixings, like in the image you sent, it can look great. But they all seem to come with clunky visible brackets, bolts and fixings which ruin it for me. We’re going with a simple powder coated metal handrail and will fix something temporary on the open risers which we’ll whip off again once we’ve got them signed off by building regs. That’s the plan anyway! Hellooooooooooooooooooo! I’m back! I didn’t mean to be away for so long because I love coming here….And I’ve been missing out on a loft conversion. I’m going to have to go and have a proper mooch! Oh, I love the birch ply!! I love the layers. It is totally beautiful. We have some furniture in the extension that has that kind of ply…In oak, with a melamine top/edge – Got it from your neck of the woods, Red Brick Mill. The layers are my fave thing! (well, Lindt Lindor and Hugh Jackman are also up there but I do love those stairs).